Community planning events allow people to produce plans of action at carefully structured sessions at which all those affected work creatively together. They can be used at any stage of the development process and provide an alternative to reliance on bureaucratic planning. The nature of the community planning event is decided on and agreed by the main parties involved. There are many common types and the scope for inventing new formats is unlimited. Events may last for an afternoon, a weekend, a week or a month. Preparation takes place including arranging timetables, venues, publicity, equipment, technical support, background information. The event is held, often assisted by a facilitator or team of facilitators from elsewhere. Proposals for action result. Local residents, business people, professionals, officials and politicians all work creatively together for an intensive period. Conventional boundaries tend to break down, releasing spirit, humour, imagination, positive thinking and collective creativity. Photos such as this are often taken to celebrate this energy. Careful planning and preparation are essential. Try and get some documented research and preliminary consultation input from key interested parties prior to an event. The creative burst is always part of - albeit a key part of - a longer process. Imaginative timetabling is crucial. Try linking up with other activities such as local festivals, anniversaries, conferences, etc. Common for many events, regardless of length. Workshops, plenaries, individual and group working. 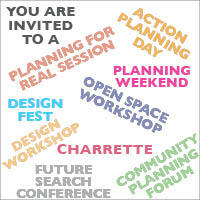 Workshops, plenaries, design sessions, individual and group working. Report writing, photo selection, drawing, model-making. Slide show, film, public meeting, symposium. Some key moments in the evolution of community planning events. 1967 American Institute of Architects (AIA) responds to citizen in Rapid City, South Dakota, USA and sends a team of architects to look at problems facing the community. Programme of Regional/Urban Design Assistance Teams (R/UDATs) launched by AIA with an average of five events organised each year. Process improved with each experience. 1978 Similar programmes start to be evolved locally in the USA at state level by universities and colleges and by local partnerships including local AIA Chapters. These become generally known as Design Assistance Teams (DATs) although programmes have different names. 1980 AIA starts Generic R/UDAT programme to deal with problems common to many communities. Three events are organised over the next five years. 1981 Planning Assistance Teams programme started by US Air Force using R/UDAT process during weekdays to examine planning issues relating to its bases. 125 events held over next 10 years. 1985 First UK pilot event organised in St Mary’s, Southampton by the Royal Institute of British Architects. It is called a Community Urban Design Assistance Team (CUDAT). Attempts to start a similar programme and support service to the AIA fail to get off the ground. 1988 Birmingham’s ‘Highbury Initiative’ introduces ‘think tank’ style events to the mainstream UK regeneration scene. Handful of UK practitioners and community leaders take part in a joint US/UK team for a Generic R/UDAT in Pittsburgh, USA. It is the largest event ever held and is visited by HRH The Prince of Wales. This leads to a handful of events in the UK organised independently by those who took part. 1989 First UK ‘community planning weekend’ held at Bishopsgate in London’s East End. Duchy of Cornwall hosts ‘planning weekend’ at Poundbury, Dorchester. 1990 American Institute of Architects produces handbook encouraging others to provide organisational support frameworks at state and local level. Over 100 R/UDATs and several hundred DATs have now been held throughout USA. Urban Design Group organises its first event at Wood Green, London. 1991 UK consultants team up with German group and organise a ‘planning week’ in Moscow. Urban Design Group organises week-long ‘UDAT’ in Pereslavl Zalessky near Moscow. 1993 Business in the Community organises its first event at Burgess Park, London. Urban Villages Forum organises its first event at West Silvertown, London 1994 Urban Design Group announces intention to mount UK support framework. 1995 ‘Action Planning Task Group’ formed by handful of national organisations to coordinate promotion and support services. UK consultants organise events in the Shankill Road, Belfast and at Hellersdorf, East Berlin. 1996 Action Planning handbook published by The Prince of Wales’s Institute of Architecture. Launch event at St James’ Palace, London. 1997 First Middle East event held in Beirut and Sidon. 1999 First Enquiry by Design events organised by The Prince’s Foundation at Northampton and Basildon. 2003 First major Stakeholder Participation Day organised for Cambridge Southern Fringe area development framework. 2005 UK Government reinforces need for Community Planning Events in its Planning Policy Statement on Delivering Sustainable Development (PPS1). 2006 First trial Reinvigorate event organised by British Urban Regeneration Association in Bristol. 2008 Publication of The Community Planning Event Manual; a revised and updated version of Action Planning. The site editor will contact you to let you know whether the material can be used, what further information is needed.